Every once in a blue moon I'll take a chance on a book without really knowing much about it. Sure, I saw An Ember in the Ashes around A LOT before it actually came out. In fact, I may have posted it for a WoW one week. But I have mad skills when it comes to not actually paying attention to what I'm looking at. When I saw An Ember in the Ashes on the shelf in early May, I grabbed it up before I could really see what I was getting myself into. Because, really, that cover is TO DIE FOR. Once I started reading, though, I knew I had made a really good decision. The characters in An Ember in the Ashes were really something special. There are no Mary Sues here. At least I didn't think so. Laia is a Scholar - one of a community of people who is constantly suppressed by the Empire because of a long-ago war. Immediately, her world is torn apart by one of the Masks, a heavily trained soldier who has been bred for violence and hate. From chapter one Laia is forced to make difficult decisions that show her true character, and it isn't one that is necessarily immediately likable. Laia is very hard on herself throughout the book and lacks self-confidence, though this is understandable as her backstory is uncovered. She turned out to be a character I really ended up feeling strongly about as the book progressed. While romance does have a place in the story, it is very secondary to the main plot. There was actually kind of a love square, with both Laia and Elias already having other possible interests before meeting. This did not detract from the story in any way though and was a very minor point. I've already touched briefly on the world that's presented in An Ember in the Ashes, and... just WOW! This world is so amazing and real and I felt like I could see every place the characters were. I have come to absolutely adore books with maps because they help me to get into the setting - and this book had two! One of the entire world (country?) and one of the school itself. Sabaa Tahir is an amazing world builder, that's for sure! Finally, let me say a few words about the plot of this book. It.Was.Heartbreaking. From the opening chapter, I just could not understand the absolute despair every character in this book was faced with. As the book went on I actually started to dread each new trial they faced, not wanting to see what terrible thing could come out of it. I think I can honestly say this is the first book that actually left me with an actual PAINED HEART on multiple occasions. Um... ow. But that's what made it so good! I felt for every single one of these characters. There were times when I didn't think I could even go on and I was just reading it! And then the ending just killed me! How am I supposed to wait a whole year for book two? 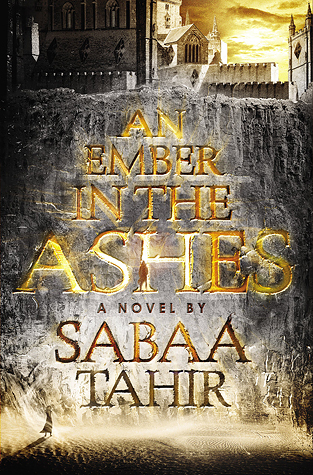 I would seriously recommend An Ember in the Ashes to basically everyone. I feel like it's a book that has something for lovers of multiple genres. And it will make you FEEL! Seriously, everyone go out and buy a copy so we can cry about the year-long wait together.